Siemens appliances are a premium brand of kitchen appliances and use innovative technology. They can achieve outstanding engineering with leading edge design and efficiency, providing kitchen appliance perfection and precision cooking. Siemens appliances utilise greener solutions saving water and energy providing you with many benefits. Combined with the sleek, modern designs, Siemens appliances offer a unique blend of style and efficiency. Kitchen Designers are proud to be associated with Siemens and are able to offer competitive quotes on the complete range whether or not you are buying one of our quality kitchens. The oven range provides coordinated and stylish products with technology on the inside that enables you to create and enjoy delicious meals. Uncluttered fascias feature high resolution displays and touch sensitive electronic controls. 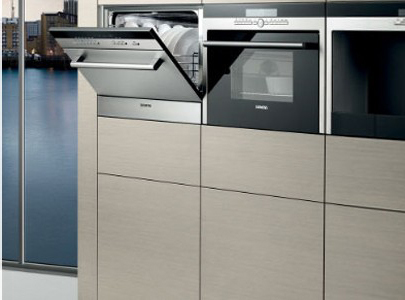 The complete design allows for perfect coordination between Siemens appliances. The oven cavities have a telescopic rail system that glides out effortlessly so you don't need to reach inside a hot oven. Active Clean heats the oven cavity to 480C and burns away all debris form cooking leaving you with an immaculate oven interior. Siemens ovens have 68 automatic programmes and the oven recommends the correct settings for the meal you want to cook. 3D hot air cooking is the perfect time saver allowing you to cook sweet and savoury food at the same time. As the air flows over each shelf individually there is no mixing of flavours. The pizza setting is a favourite and is perfect for crisping bases on pizzas. Combine ovens, microwaves, steam ovens and barista coffee machines for the ultimate in cooking arrangements. These are inspirational products for modern kitchen design giving you clean vertical lines whether placed side by side or as a column. They can be combined with a warming drawer to align perfectly with the full sized oven range. These hoods provide the style you would expect and are highly effective at keeping steam and cooking odours at bay. The range includes chimney hoods, ceiling hoods, telescopic and integrated hoods all with the power to perform. They have many features including automatic after running, climate control sensor, electronic soft touch, intensive setting, interval operation setting, rim ventilation and many more features all designed to make your experience of cooking more pleasant.